A warm-hearted story, filled with laughter and excitement, about how you can if you only dare, about how dreams can come true, and how a clown child, even though she's small, can be the audience's favourite. Our play is especially intended for children aged 3 - 6 and everyone else who is prepared to be enraptured and enthralled. In this production we use table puppets that resemble Japanese bunraku puppets. 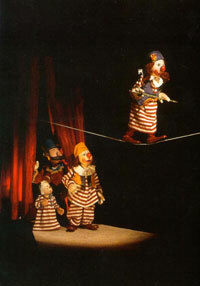 Although they are worked on a table by visible puppeteers, they appear to live a life of their own. Their special design, allowing great freedom of movement and expression, was a precondition for the circus acts in the show. Their unique, highly advanced technology has been developed by Dockteaterverkstan ( The Puppet Theatre Workshop ). Puppets and set were designed and constructed by Anders Lindholm and Cecilia Billing, who can also style themselves script-writers, directors and puppeteers. The music in the show is recorded. It was performed by Jonas Eilert on sousaphone and banjo. One company that cares about quality and the total experience is Dockteaterverkstan from Osby. This year they appeared at the puppetry festival with "August, Augusta and little Augustin" for children between three and six years old. Four well-made, beautiful puppetsworked by visible puppeteers tell a simple little story about a circus family where everyone is brave and clever - as long as they get a chance to try. The tone of voice used to the children and the consistent level of abstraction are other ingredients of the story-telling. In other cases, puppet-theatre performances often show weaknesses in script and dramaturgy. Empty words often fill the gaps between more or less virtuoso numbers by the puppets. The emphasis is placed on the puppets' technique, and instead of portraying character there are illustrative games. Both tiny tots and quite big children can enjoy the direct contact between puppets and puppeteers. The story is as simple as can be. August, Augusta and their little Augustin are a family of clowns at the circus. August works and must show his clown tricks while Augusta keeps the home in order, washing clothes and dishes and looking after Augustin. A proper family life and division of roles? Well, when August gets toothache and has to go to the dentist, Augusta shows that she really can take over his tightrope act, and so the balance is restored. Mothers and fathers would enjoy this story, and they would also appreciate the Swedish Dockteaterverkstan's rather playful openness about the relationship between puppeteers and puppets that talk to each other. For the youngest ones the most important thing is probably that the three members of the clown family are irresistibly nice puppet characters and that the story and the puppeteers' play with the puppets is simple and easy to follow. Isn't it most fun to see adults working and playing with the puppets and talking to them, and imagining that I can do it too? This is a playful, down-to-earth performance: it's neither an adventurous, fantastic story nor an exciting or scary one. But that can be good too. An audience between three and five won't have to risk being frightening or confused.